One of the reasons I greatly prefer Al’s originals to his parodies is because they tend to explore darker, deeper and more demented subject matter than the hits he’s known for. To generalize, Al’s parodies focus on the evergreen territory of food, television, TV and movies (specifically the Star Wars motion pictures, although God knows his oeuvre is overflowing with nods to Star Trek as well) while his originals are more likely to be about torture, murder, insanity, death, romance as a horrifying form of mental illness, mental illness, insanity and crazed narcissism. It’s on the originals that American pop parodist Al Yankovic truly gets “weird” and “Weasel Stomping Day”, the ultimate deep cut, is a beautiful example of just how strange and ghoulish Al can get when he’s not worrying about appealing to the narrow sensibilities of radio people or the pop market. That’s not Al. He’s not a crazed libertine flaunting his contempt for bourgeoisie society but he does have an underlying sadistic streak that finds perhaps its purest reflection in this chipper little tune about a fictional holiday where, for reasons seemingly lost to time, children and adults alike put on viking helmets, slather mayonnaise on the lawn and brutally torture and then murder weasels. I never got around to seeing this so, Will Forte RIP? Loved you in MacGruber. Did my ancestors say yes? Let’s just say my second son’s bris is scheduled in about a month. “Weasel Stomping Day” is as cloying sonically as it is deranged thematically, a wholesome 1960s family cartoon family-friendly song about the least wholesome, family-friendly subject matter imaginable: the mindless slaughter and mass murder of terrified, blameless animals by Americans driven into a frenzy of violent madness by something as simple and banal a holiday with singularly barbaric customs. Holidays, real and imagined, are invariably dark days in Al’s world, as evidenced by his pair of apocalyptic, bloody Christmas songs and his equally apocalyptic birthday song. 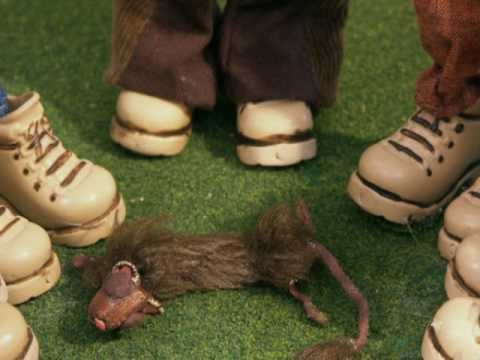 “Weasel Stomping Day” starts dark and gets increasingly brutal until words cheering the ritualistic assault and killing of small animals are augmented by the sound effects of of the crunching of weasel bones as they’re beaten bloody en masse. I'm not sure this is an accurate quote. I have now written one hundred and thirty seven articles about the songs of American pop parodist “Weird Al” Yankovic. I’m writing my second book about him and have been to, I believe twelve or thirteen of his concerts. I’m fairly familiar with his aesthetic and his work and I still found myself cringing a little in simultaneous mortification and amusement that one of his songs went to such a dark, brutal place. It was redolent of the many moments on tour when I would look around and see audience members literally gasping with surprise at a particularly dark song or nasty turn of phrase. “Weasel Stomping Day” illustrates that deep into his career Al retained the awesome power to shock and surprise as well as delight and amuse even his most devoted and obsessive fans.